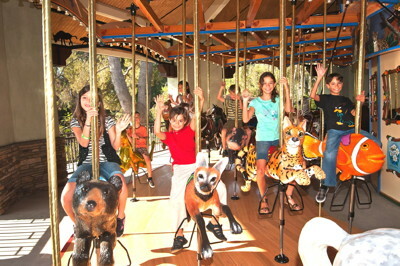 65 excited fourth graders from Sunny Sands School jumped onto their favorite animals and took the first spin on the Los Angeles Zoo’s handsome new carousel today. 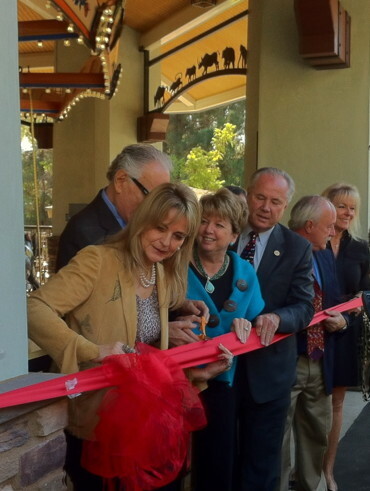 The new Tom Mankiewicz Conservation Carousel is not your everyday merry-go-round. This stunning handmade wooden carousel features 66 artisan-crafted figures as diverse as a komodo dragon, poison dart frog, Sumatran tiger and a dung beetle chariot. 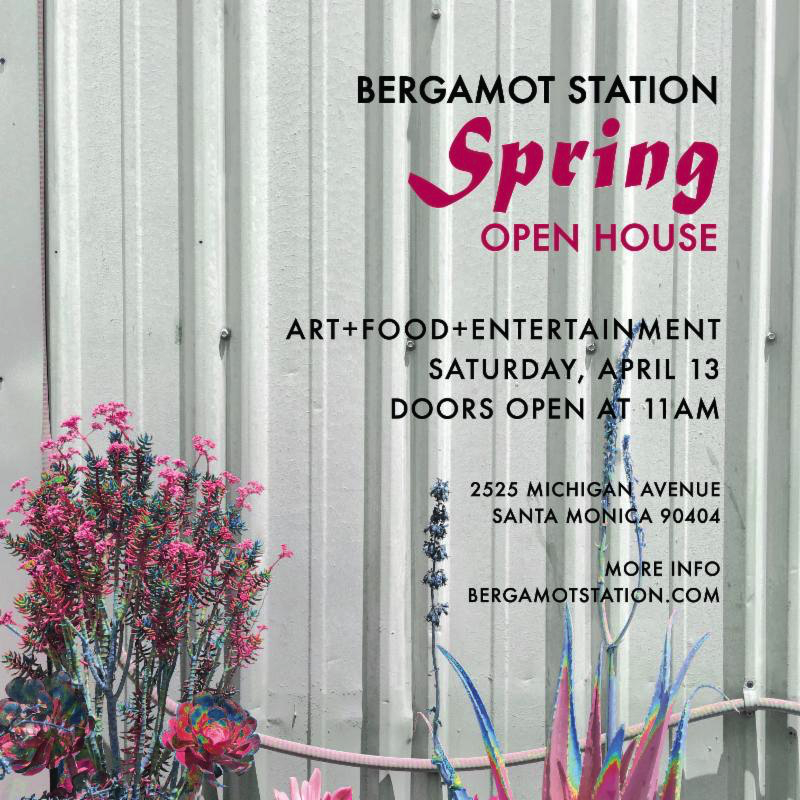 Gorgeously constructed, it is set apart by the quality of its exceptional craftsmanship, vibrant color, sense of fun and lively depictions of endangered wildlife and California flora and fauna. Every hand-carved and hand-painted figure on the Tom Mankiewicz Conservation Carousel is a beautiful piece of art, right down to the vivid décor of each saddle. Many represent animals residing at the Zoo. This fun addition to the LA Zoo was commissioned by the private, non-profit Greater Los Angeles Zoo Association (GLAZA) and made possible by a generous gift from Ann and Jerry Moss and by figure sponsorships from individual benefactors, is the only one of its kind in Southern California. As an homage to the traditional art of carousel creation, there are horses, including an exceptional equine trio prancing among the carousel’s more exotic fauna: three of horse racing’s illustrious stars: Zenyatta, Giacomo and Tiago, in tribute to Ann and Jerry Moss, their owners, who were on hand for this morning’s ribbon cutting ceremony. 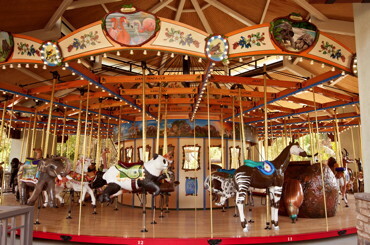 The Tom Mankiewicz Conservation Carousel was named by the Mosses in honor of their close friend, the late screenwriter, director and producer whose credits include the first two Superman movies, the James Bond films Diamonds are Forever, Live and Let Die and The Man with the Golden Gun, and the Hart to Hart television series, among many others. Mankiewicz was Chairman of GLAZA’s board from 2002 until his passing in 2010, and a staunch supporter of the Zoo’s conservation efforts. The quirky dung beetle chariot was made possible by his individual sponsorship. More than 40 figures have been claimed for sponsorships to date, among them Snakes on a Log (GLAZA Trustee Slash and his wife Perla), the Praying Mantis (GLAZA Trustee Holly Robinson Peete), and the Bear Cub (the Elton John Charitable Fund). A few animal sponsorships remain available; for opportunities, visit their official site. 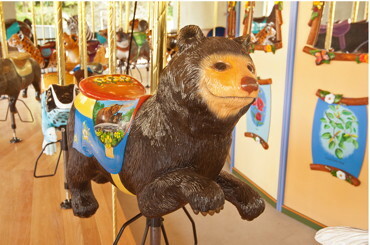 Appealing as much to adults as to children, the carousel’s design includes a centerpiece surrounded by painted murals that take riders around a whimsical dusk-to-dawn pictorial of the world’s wild animals in unexpected settings — from Malibu to Hollywood — and the carousel spins to music by the Police, Go-Go’s, Cat Stevens, Amy Grant, Janet Jackson, Bryan Adams, Joe Cocker, Styx, the Carpenters, Herb Alpert and the Tijuana Brass and other recording artists from the A&M label co-founded by Jerry Moss with Alpert. 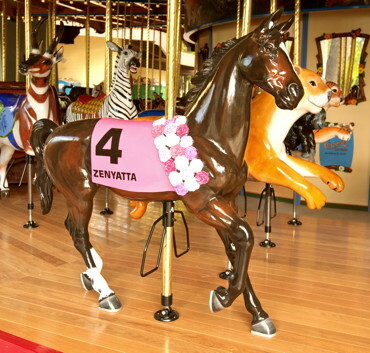 The Tom Mankiewicz Conservation Carousel was created by master artisans of Ohio-based Carousel Works, the world’s largest manufacturer of wooden carousels, continues a centuries-old tradition. Guests are sure to discover something new with every ride or walk-around, including figures of endangered animals the Zoo is actively striving to preserve, among them the Asian elephant, snow leopard, mountain tapir, Chacoan peccary, lowland gorilla and peninsular pronghorn. Individual animals commissioned specifically for the Los Angeles Zoo are the peninsular pronghorn, the maned wolf and the serval. Unexpected figures taking a twirl are a blue scarab, honeybee, clownfish, baby rhino, double-wattled cassowary and one of the Zoo’s freeloading night visitors, a skunk. A beautiful peacock chariot is universally accessible. Artwork throughout the carousel represents life in California, showcasing flowers and birds, all native to the California habitat. Look for Indian paintbrush, lilacs, sequoias and coast live oaks on the inner panels and portraits of the California gull, red-tailed hawk and quail (the California state bird) on the outside crown. Notations above identify each animal and insect figure, and sponsors are acknowledged on a plaque at the base. 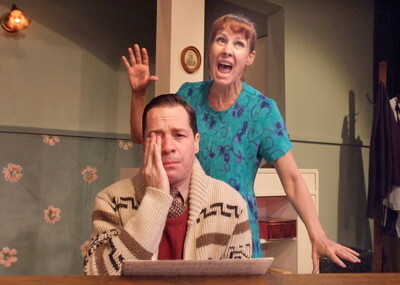 PHOTO CREDIT: Jamie Pham and Pauline Adamek.